Lengthening the spine is an important component of the Gokhale Method and the best way to begin a posture transformation. Creating space between the vertebrae decompresses the discs and promotes healthy nerve function. Allowing your spine to be in gentle traction often throughout the day is an excellent way of creating a healthy baseline. We can do this by sitting, standing and sleeping with good posture. In addition to these Gokhale Method basics, sometimes your back muscles crave an even deeper stretch. Below I’ve outlined three additional ways you can stretch your spine that are safe and therapeutic. Especially if you have back pain or a very sensitive back, creating a gentle stretch over a long period of time is a wonderful place to begin. Using external objects such as your bed (Stretchlying on the back or side), or your chair’s back rest (Stretchsitting), or a Stretchsit® Cushion​, can help stretch your back and relax your muscles. You can find directions for these techniques in 8 Steps to a Pain-Free Back. Stretch your spine while you sit. Click here for an instructional video on stretchsitting. One of the steps in stretchlying. Click here for an instructional video on stretchlying. There are times when you will not have the support of an external object. 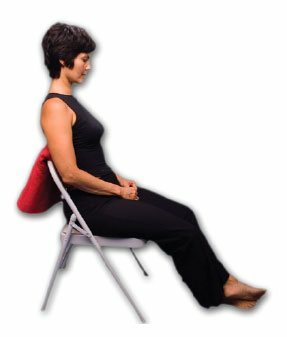 When you sit without a backrest or stand up, you still have the ability to lengthen our spine. By engaging your deep abdominal and back muscles, you can make yourself taller with the Inner Corset. Not only will this protect your spine during times of activity, or when lifting something, it can also provide an excellent stretch for your erector spinae muscles (the long muscles that run parallel to your spine). The erectors can be very tight for some of us, especially if we are struggling with a swayed back. Lift your arms high above your head as though you are reaching for a high shelf slightly in front of you. Then let your chest come up and around an imaginary bar at chest height, so as not to bend backwards into an arch. Feel how tall you can make your self and try and maintain that height even after the arms come back down to your sides. Steps to engaging your inner corset. Download this chapter here from 8 Steps to a Pain-Free Back. The ability to isolate the movement of your ribcage from your pelvis can be a challenging but excellent way to stretch your deepest back muscles (multifidi, rotatores). Stand in front of a mirror with your feet at least hip distance apart. Set your tallstanding position well with kidney bean shaped feet, soft knees and your ribs anchored with an anteverted pelvis. Place your hands on your hips to help keep them still. Then, let your entire ribcage shift laterally to the right. Feel a satisfying stretch in your deep back close to your spine. Then shift the ribs to the left. Watch that your pelvis doesn’t tuck or lift to one side. Also try and maintain your rib anchor as the ribs shift side to side—the front of the ribs want to stay flush with the abdomen, or you will sway your back. Try holding each side for 5-10 seconds at a time and try for about 20 reps. Or put on some engaging music and let your body yield to the rhythm. Anchoring your ribcage and shifting it from side can be a great stretch while standing. The “QL” is a muscle that connects the back of your pelvis to your ribcage. It’s common for QL to be tight, unilaterally or bilaterally. When QL is tight on one side, it is often misdiagnosed as a leg length discrepancy and the person may be given a shoe lift that exacerbates the problem (always get this diagnosis double-checked). To stretch the QL muscle, find an open doorway with some room to the side to arrange your body as shown in the photo below. Create a long arc running from your left hand past your outstretched left arm, through your torso to the leftt leg through to the left heel. Lengthen this arc (and your left QL) by hooking your left fingers around the door jam and pulling your left foot away from the hold while gently arcing your body and stretching the left side of your torso in the process. Your left arm should be straight, your right leg forward and bent, and your left leg back and straight. Hold for at least 20 seconds to give your QL muscle a chance to release deeply. Repeat on the other side. Left QL stretch using a doorway. Place your lower legs about hip width on the floor and running parallel to each other. Toes relaxed. Place your forehead on the floor and your outstretched arms at a comfortable width as in the Muslim prayer position shown below. Let your bottom, the highest point in your body, gently pull away from where your forehead is weighted to the floor. Let your back mucles relax into a vertical stretch; let your outstretched arms augment the stretch around your spine at the shoulder blade level. It takes about 20 seconds to release the paraspinal muscles into this stretch. These are fabulous stretches, the feel so so good. Thank you.